Once logged in, I can Browse->By Location->North America->United States->Florida->Miami-Ft. Lauderdale. 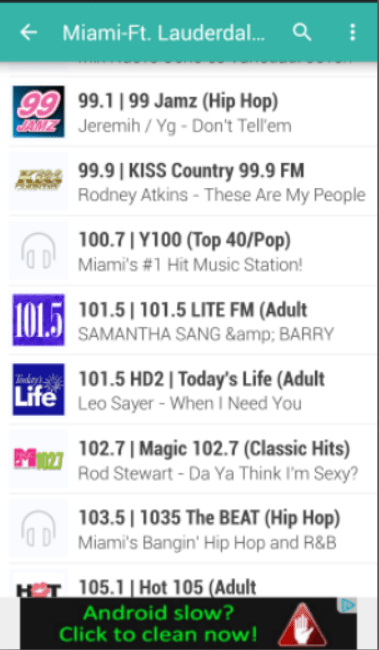 I now see dozens of real radio stations listed by frequency number. So it’s easy to find 102.7 “Magic” that I used to listen to all the time when I lived there. If I don’t know the station number, I can also search for “Magic” to find that station. This free version is supported by advertising. Don’t go clicking on that popup at the bottom that says “Android slow? Click to Clean now.” That is an ad, not a system message. You can eliminate ads by paying $9.99 one time, for the Pro version. The pro version also adds the ability to record live shows and store them in your account, like a DVR. A feature I really like is the option to set a Sleep Timer. That means I can start the radio playing when I go to bed and set it to automatically turn off in 20 minutes. You’ll find that under the Options menu when a station is actually playing. WARNING: This uses a substantial amount of data. Do not use it while you are on a limited data plan! You can adjust the “bitrate” for playing any given stream by looking under the Options menu –> Choose Stream. The lower the bitrate, the less data it uses. In addition to live radio stations, you will also find archives of radio shows. So, if you like NPR’s Prairie Home Companion, you can listen to it 24/7! Just search for Prairie Home Companion. After you listen to it once, it will be in your list of Recent stations so it is easy to find the next time. Published by MrsGeek, in Blog. Tagged with #GeeksWhoTeach, Android, Apps for Travelers, Droid, Geeks on Tour, iPad, iPhone, Radio on the Road, Smartphones, Technology for Travelers, TuneIn Radio.